If you aren’t too familiar with the current fantasy and/or horror that is being published today, or if you only know these genres from the novel form, there is no better place to start than this mammoth collection. Featuring varied stories across the genres from both print and electronic sources, regular and individual publications, established and upcoming authors, Paula Guran assembles a great overview of 2014. 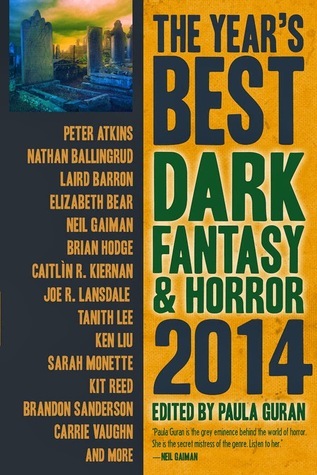 As typical for these types of anthologies, I wouldn’t consider all of these my favorites of the year – and some of the stories here I had no appreciation for at all – but there is assuredly a good chunk of material to satisfy most readers here. Even if you don’t normally read short stories, this would be useful for finding authors whose voice and style you enjoy to perhaps then search out a novel you otherwise would never have picked up. A handful of stories in this were familiar to me from their original printings in the magazines I regularly consume and for the most part they had remained in my mind fondly. Kabza’s “The Soul in the Bell Jar” and “Fishwife” by Carrie Vaughn fall into this category with tales that feel timelessly familiar yet with beautiful unique voices. I also adored “The Creature Recants”, by Dale Bailey for its take on the outsider ‘monster’ and for being immersed in the world of film and the classic Universal Films Horror. The story isn’t particularly dark or horrific (in the sense of scary), however, and indeed many of the stories in the collection aren’t particularly ‘dark’, so don’t let that term scare you off if you don’t typically go for such tales. The majority of pieces included in the anthology were completely new to me. Since I first read about it prior to its release I’ve been interested in Nathan Ballingrud’s North American Lake Monsters from Small Beer Press. “The Good Husband” affirms this feeling and his collection now is in the top of my list of volumes to get as soon as possible. I was also particularly impressed by Schow’s “Blue Amber”, Evenson’s “A Collapse of Horses”, and Marshall’s “The Slipway Gray”. (I have a review of a Marshall collection that I read soon after this coming up). Some of the authors known to me have strong showings here, particularly Tem (“Wheatfield with Crows”), Gaiman (“A Lunar Labyrinth”), and both Lees (“A Little of the Night”, Tanith and “Iseul’s Lexicon”, Yoon Ha). Typically I’m nothing but praise for Ken Liu (I can’t wait to write up the review of his upcoming novel), but “The Plague” failed for me here. I may try a reread, but it felt too short and unfulfilling. One of the things I noticed in the midst of reading this anthology was a few stories that are written in the second person. Unfortunately I’ve been noticing this crop up more frequently throughout my reading. I don’t know if this is because I’m reading a greater range of short fiction or if it is some kind of trend, but I find it incredibly awful. In general I know most people feel this way and that the stories published with the narration constantly referring to ‘you’ are supposed to be the minority exceptions where this point of view is made to work. Only in the extreme minority of these published cases do I find them worthwhile, and in most of those cases it is just random chance that they do align vaguely with ‘me’. I previously reviewed the 2014 science fiction entry from Prime Books ‘Year’s Best’ series for Skiffy & Fanty. Both that anthology and the one here were the first I’ve read in the series. Despite reading fairly widely in the genres there was a lot of new stuff here for me to discover and fond rereads. I look forward to the years to come. Disclaimer: I received a free advanced reading copy of this from Prime Books via NetGalley in exchange for an honest review.